Fully furnished, three bedroom, two bath house, situated on your own private lake. 50 acres of lake and landscape out your back door. Bedrooms are one queen with bathroom and tv, second bedroom with queen bed, and third bedroom with 2 single twin beds. Living room has a double sofa bed. Fully equipped kitchen with dishwasher, laundry room with washer and dryer. Large patio area with table and chairs. Just bring your clothes everything else is provided for a wonderful vacation in South Florida. 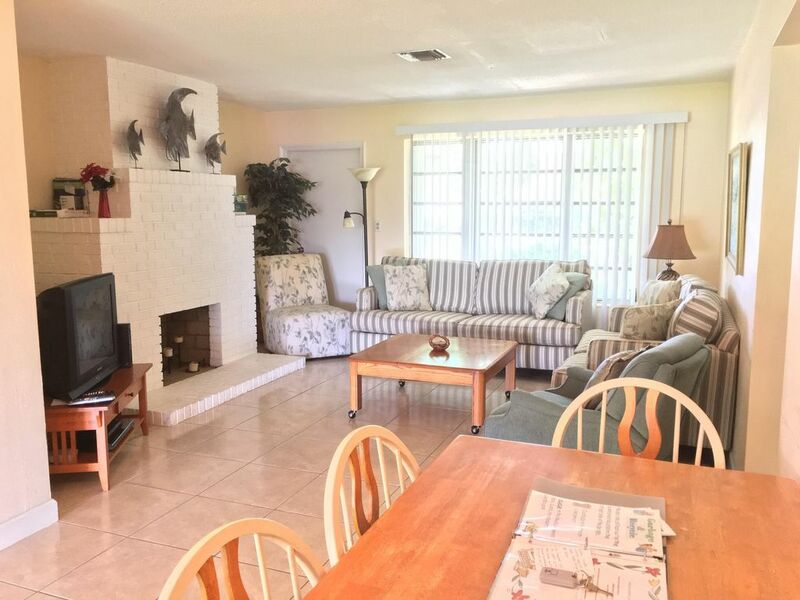 This is such a unique rental, you will not find another place like it in South Florida. Water Skiing: We are located on a 50 acre fresh water lake. You can reserve water ski lessons if you would like to try. The ski school is open 6 days. They can be reached when you get to the property. Located on private, 50 acre, gated, water ski lake. Water skiing available but not included in the price. Great fishing. Two lighted tennis courts. A wonderful private holiday home. We loved our Spring Break stay in this cozy home. We brought four of our kids and they loved fishing in the lake, watching the iguanas, and playing basketball. The home was very clean, well stocked, and comfortable. It was a great “launching pad” to get out and explore the area! Great location for a few days of golf. Joyce was very welcoming and hospitable. House lovely and clean. We had a nice experience. It was good overall. I definitely recommend this place.! The house was perfect for me and my family. Enjoyed the view and Joyce is a very nice lady. Endroit tranquille, près des épiceries, loin de l'action de la ville. Belle vue du lac,un patio. Nous ne manquons de rien, cuisine bien équipés, lit confortable,belle salle de bain. Commodités incluses. Le seul commentaire négatif est que les murs et plafonds ont besoin de réparation et de peinture. La propriétaire est au courant qu'il y a des travaux à faire. Les propriétaires sont sympathiques et très discret. Thanks. It was a pleasure having you. Great place to just chill after a long day. Joyce was fantastic and helpful.